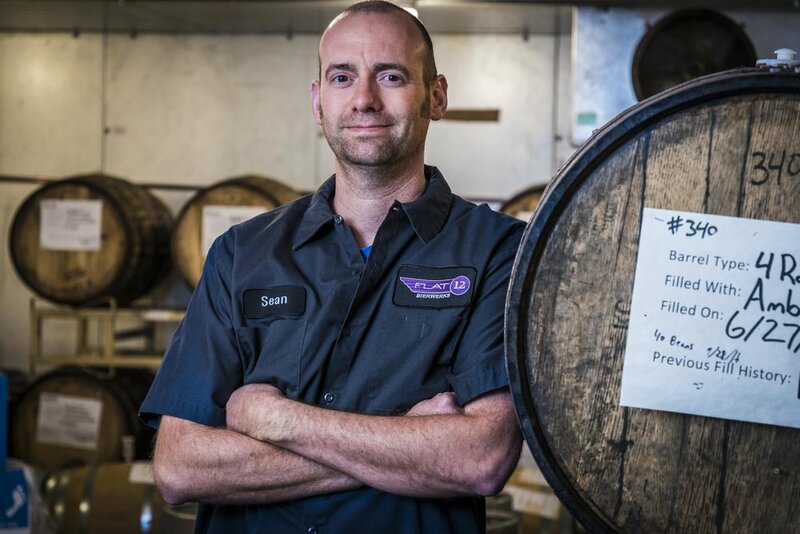 Managed by Head Brewer Sean Lewis, Flat12 Woodwerks brings you the best in rare wood-aged brews for limited releases, bombers, special tappings, festivals and events. Lewis chooses select beers of all varieties and styles to age in Tequila, Whiskey, Rum, Wine, and Port barrels for up to 6 months. The barrel aged beers continually rotate, but the taproom favorites often make their return. Flat12 has been creating barrel-aged beers since our start in 2010 and it has naturally grown into Woodwerks barrel program. The program continues to grow every year, and in 2016 we expect to release 40 different barrel aged brews. Follow @Flat12Woodwerks on Twitter, and sign up for the mailing list for the latest news and releases. Flat12's cellar houses a variety of barrels like bourbon, tequila, rum, wine, and port barrels.